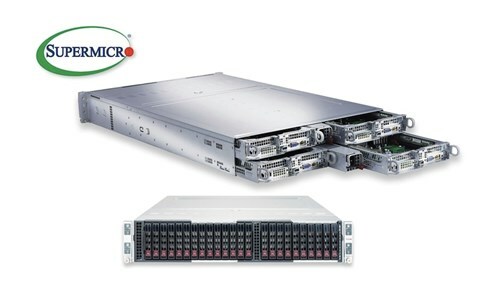 BigTwin™ is the First and Only 2U Multi-Node System supporting the highest performance 205 watt processors, full 24 DIMMs of memory, 24 All-Flash NVMe Drives and an industry leading 30% better thermal capacity - optimized for today and future proofed for the next generation of technology breakthroughs. 30% better thermal capacity in a compact 2U form factor enables configurations with the highest performance processor, memory, storage and I/O leveraging the Titanium level 96% efficient PowerStick power supplies (2200W/2600W). 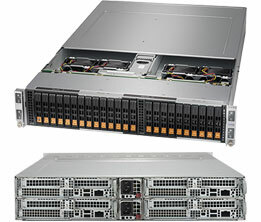 Extending the industry's largest portfolio of server and storage systems, the BigTwin is ideal for customers looking to create a simple to deploy and manage blazing fast high-density compute infrastructure. This new system is targeted for cloud, big data, enterprise, hyper-converged and IoT workloads that demand maximum performance, efficiency and flexibility. Due to the complexity of integration, this product is sold as completely assembled systems only (with minimum 2 CPU, 2 DIMM, 1 HDD/NVMe and 1 NIC or SIOM card per node). Please contact your Sentral sales rep for special requirements.